Federal authorities last week busted what they said was one of the biggest counterfeiting schemes in United States history, which allegedly used phony checks to try to bilk hundreds of millions of dollars from many prominent Philadelphia institutions - including the University of Pennsylvania. A federal grand jury indicted 38 people on charges of racketeering, bank fraud and other charges related to a massive fake-check scam. Members of the group allegedly obtained microfiche copies of corporate and business checks and then "fraudulently represent[ed] themselves" to printing companies to order books of blank checks, according to a statement released by the U.S. Attorney's office. Reginald Greene, 38, of Philadelphia's Overbrook Park section - about four miles west of the Penn campus - is accused of being the operation's ringleader. Greene served 20 months in prison in 1991 on fraud charges. In 1996, authorities in Delaware prosecuted him on similar charges but failed to get a conviction and eventually dropped the charges. Greene's attorney, Dennis Cogan, said Wednesday that Greene plans to plead not guilty. He emphasized the charges so far are simply "accusations." "He's been down this road before and knows it's an accusation and that's all it is," Cogan said. The scheme, which allegedly began in 1993, centered around large Philadelphia-area corporations, including the Philadelphia 76ers, WPVI-TV, U.S. Healthcare, the Cozen and O'Connor law firm and several charitable and educational organizations. According to the U.S. Attorney's Office statement, Greene's organization was very complex. Greene and 15 "lieutenants" allegedly ordered tens of thousands of blank checks and then delivered them to various "check passers," who deposited or cashed them. Check passers often had false identities and disguises, the statement says. The real victims, though, are the 14 financial institutions and credit unions, which agreed to repay Penn and the other organizations the collective losses of $6 million. Total losses could have been in the range of $1 billion had more of the group's checks cleared, authorities said. University officials yesterday were still reviewing the case. Because the banks have agreed to repay the institutions, it is unlikely that Penn will suffer any economic losses. Most of the defendants have been arrested and are in custody. Bail hearings are being held this week and next. Cogan said he expects a trial to begin in about six months. Assistant U.S. Attorney Amy Kurland, who is one of the lead prosecutors for the case, said she expects many of the defendants to plead guilty and that she will try those who don't together. Agencies including the Federal Bureau of Investigation, the Secret Service and the Philadelphia Police Department have been investigating the alleged scheme for several years. Officials are still trying to determine how the ring was able to obtain the microfiche copies of blank checks. One of the suspects arrested worked for one of the institutions that was victimized, authorities said. A female resident of Duke's Wannamaker 1 Dormitory was taken to the hospital early yesterday morning after reportedly being injured in a blast from an explosive device placed near her dormitory room, said Major Robert Dean of the Duke University Police Department. Dean described the incident as follows: The student was returning to her room between 1:00 a.m. and 2:23 a.m. when the device -described by police as a 32-ounce plastic Gatorade bottle containing aluminum and some liquid substance - exploded in the hallway outside her room, injuring her left leg and knee. The victim, who lives in a first-floor triple, said there were two blasts on her floor. The first - which she said occurred at about 2 a.m. - was in the hallway outside another nearby room. Upon hearing the noise, the victim said she went to her blockmates' room to talk about the incident. When the victim returned five minutes later, she said, the door to her room was half open, although she was not sure whether she had left it open originally. As she was writing a message for her roommates on her dry-erase board, the pressure of her writing started to open the door further. At that time the second device exploded, she said, explaining that the bomb was probably near the door. The victim's resident advisor called the police, who arrived about 20 minutes later. "I was sitting there on the ground, thinking to myself, �What the hell just happened?'" the victim said. In an interview Tuesday afternoon, Dean said there was only one device on the first floor and another on the second floor that exploded slightly earlier. 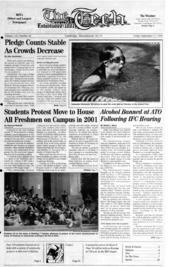 At an emergency dorm meeting late Tuesday night, however, Detective Thessie Mitchell of Duke Campus Police confirmed that there were two explosions on the first floor and that there might have been a third elsewhere in the dorm, although no material evidence was recovered from the possible third explosion. On the first floor, students reported that the liquid substance inside the Gatorade bottle was giving off a gaseous smoke that smelled like sulfur, Dean said. Mitchell said police had to neutralize an acid on the floor. He added that evidence from the incident has been sent to the State Bureau of Investigation for analysis. An analysis of the liquid and a test for fingerprints will be completed within one to three weeks, Mitchell said. He added that the device was probably something one could make at home with ordinary chemicals. Mitchell said the device exploded due to increased gas pressure caused by a chemical reaction inside the bottle. Police are unsure whether the explosion was specifically directed toward the victim. She said she could not imagine why anyone would want to target her specifically. Mitchell said last night that police think the perpetrator was familiar with the layout of the dorm. If anyone were caught, he explained, the person would probably be charged with a felony. Mitchell added that Campus Police is considering whether yesterday's incidents could be related to a smoke bomb which set off a fire alarm in the same dorm Aug. 28. A fire that broke out in the basement of the Indiana University Theatre Wednesday afternoon could have easily burnt down the building, according to the IU Department of Risk Management. At 3:13 p.m., an alarm notified the Bloomington Fire Department and it arrived at the scene three minutes later. There were no injuries, and damage to the building was minimal. "What saved this building was that sprinkler system," said Jim Dawson, a fire engineer in the Risk Management department, as he pointed to a small sprinkler mounted near the ceiling of the basement's trap room. The room is about 15 feet by 30 feet and is used to store props for plays in the University Theatre. The sprinklers on one side of the room were activated when the temperature reached 160� Fahrenheit, said Paul Spicer, a safety engineer with IU's Risk Management department. The fire was contained by the two sprinklers and was smoldering when the fire department arrived, he said. The only losses were three boxes of light bulbs, a few rugs and a box of foam rubber, said Leon Brauner, the chairperson of the department of theater and drama. Discussing the fire afterward, Dawson told Brauner that if the sprinklers hadn't been there, "you'd be out of business." The damage did not spread beyond the room; the rest of the University Theatre and IU Auditorium were unaffected. Spicer speculated that the fire was started by welders who were working on the set for the University Theatre's production of "Six Degrees of Separation," which opens Oct. 5. "They were welding and we think an ember went down a small hole in the stage and landed in a box," Spicer said. "Everybody did a good job, and the sprinklers did a good job," Brauner said. Dawson agreed. "The sprinklers are the only fire protection system that, when it is properly used, there are no multiple-life loss fires," he said. He added the Theatre building sprinkler system had been tested recently. Brauner said the department is very concerned about safety and makes sure everyone has training. "The stagecraft class is put through fire safety. Every play that comes through, the cast and crew are taught what to do," he said. He said the department will be setting up another training session in the next few weeks to maintain safety. Testimony began yesterday in the trial of Chad Kister, an Ohio University graduate student and environmental activist facing two counts of extortion and one count of theft by deception. On the first day of what Athens County Court of Common Pleas Judge Michael Ward said he estimates to be a three-day trial, Ward heard opening statements by Athens County Prosecutor Bill Biddlestone and defense attorney Patrick McGee, as well as the testimony of two of the prosecution's witnesses. The trial stems from an incident that occurred Dec. 6, 1997 in the Big Bear parking lot. Kister allegedly accepted $1,750 from Donald Nunley, a Nelsonville resident and president of the Local 1340 Chapter of the United Mine Workers of America, in exchange for Kister's promise to keep himself and other environmentalists away from public hearings on the proposed mine in Glouster. Jury selection lasted four hours, mainly because Biddlestone and McGee were concerned about potential jurors being affected by extensive media coverage and their relationships with coal miners and other labor union members in the area. Nunley testified he had met with Kister in the week before the incident in hopes of reaching an agreement regarding environmentalist opposition to the Glouster mine. He said Kister suggested at this meeting that Nunley pay him $5,000 in return for his promise to stop protesting the proposed mine. "He said, �I could be some help to you: five grand,'" Nunley said. "I believe in clean air and clean water and all that� I wasn't going to give him money or anything or even promise him anything." But in opening statements, McGee said Kister had wanted to discuss the issue, but instead Nunley offered him money not to come to the hearings. He said Kister made it clear he could not control other people, but thought if he did accept the money he could use it toward other causes, such as his crusade to save Dysart Woods. "Chad made it very clear he couldn't control other people," McGee said. "He left wanting to think about it." Although Nunley said he called the Athens Police Department because he felt uncomfortable about being asked for money, McGee said Kister had been set up. "This is a classic case of reasonable doubt where you have one case of a sly fox who has stunned the young pup here," McGee said. Joshua Hodson, felony investigator for the Athens County Prosecutor's office, testified that Sheriff David Redecker approached him about the call Nunley had placed to the police. Hodson then placed a wire-recording device in Nunley's phone and recorded the conversation discussing the location of the money exchange. He then videotaped the meeting at the Big Bear parking lot, where officers arrested Kister. An improperly installed wire and tape recorder damaged the audio tape of this exchange, so only faint portions of the conversation between Kister and Nunley were audible to the jury. While many Ohio University students spent last week moving into their off-campus residences, three OU juniors salvaged what was left of their possessions from the rubble of their rented house. The students moved into another house after a truck lost control and crashed through the living room at their former house on Friday, Aug. 28. John C. Snyder, 56, was driving when the brakes gave out in his vehicle, according to an Athens Police Department report. Snyder attempted to stop the vehicle by driving into shrubs in the yard of 51 N. Lancaster St., but the truck continued through the shrubs and front yards of 51 and 53 N. Lancaster St. before coming to a stop inside 47 Lancaster St., according to the report. Snyder was charged with failure to control his vehicle. No one was in the house at the time of the crash, and neither Snyder nor his passenger, William Lowery, 48, were injured. Junior Meghan Gilkey, one of the three tenants of the house, said she was home in Cleveland when she was notified the truck had destroyed most of the living room and her bedroom. "I lost almost everything," she said. "I still have my shoes and my jeans, though. Basically, I still have the bottom half of my wardrobe." Gilkey said the truck destroyed all the living room furniture, which belonged to her roommate, junior Jason Shultz, as well as Gilkey's stereo, television, bed, dresser, clothes and CDs. Snyder's insurance will cover the cost of new furniture and the difference in rent between the Lancaster Street house and the Franklin Street house, Gilkey said. The university also pitched in by providing the three tenants with meal tickets for the dining halls, Gilkey said. Although the accident forced the three out of their original home, which will be demolished later this year, they are making the best of their situation, she said. An armed robbery in a Rutgers University residence hall Saturday has put some students on guard and has left police seeking two suspects. Saturday morning at 2:15 a.m., two men entered a Quad 1, house 13 room. A Black man, described as six feet tall, 18 to 20 years old, with a slim build and wearing a black nylon cap, a yellow and black striped shirt and dark pants, entered the room and pointed a gun at one of the male University students in the room. "Two roommates in their room in Quad 1, their door is not closed, they have their door partly ajar," Lt. Laura Kull of the Rutgers University Police Department said, describing the scene. The man entered the room and pointed a gun at one of the roommates' heads. The man with the gun demanded money from both roommates. He then moved to the second roommate and struck him in the head with something metal, Kull said. The student received minor injuries and was treated and released from a local hospital, Kull said. A second man, described as an 18-to-20-year-old Black male, five feet, 10 inches tall with a heavy build and wearing a dark baseball cap, was standing in the doorway. After the men took the money, they ran from the building in an unknown direction, Kull said. The police are unsure of how the two men got in, but someone might have let them in, Kull said. Kull called the incident a crime of opportunity, "Their door was open. I don't think they were specifically targeted." There is no composite of the suspects at this time, but the police currently is following several good leads, Kull said. Since the incident, many students in Quad 1 are being more cautious. Posters were put up on the entrance doors of the residence hall. The posters gave a description of the two suspects and an account of the crime. "I'm definitely [more cautious] now,� my friend, her shoes are missing� stupid little things, we don't even trust people on the floor," Livingston College first-year student Lisa Stubenrauch, a House 12 resident, said. Other students said they didn't feel secure on the campus in general. "There's not enough security," Livingston College junior Lindsay Ackerman said. "I see the Rutgers police around, but not on campus." "I lock my door now, put on the chain," Livingston College first-year student Shane Nelson, a House 13 resident, said. Students also saw it as a reflection on the University. "I don't feel safe, if anyone can come onto campus with a gun, what does that tell you," Livingston College sophomore Mohammad U.
Choudhry, a House 14 resident, said. "I'd like to see more security."